I come from a long line of canny Scots who love nothing better than hunting for free food. When we lived by the sea my dad collected seagull eggs (is this legal?). We made them into green omelettes that whiffed of fish. My mum’s an expert pignut spotter – the small, elusive plant that grows in woodlands at this time of year. It has pretty white flowers and feathery leaves. If you follow the stalk down to the root you’ll be rewarded with a small, hard nut. Peel off its little brown jacket and you have tasty (ish) snack. Sorrel (or ‘sourocks’ as it’s called in Scotland – the ‘sour’ rhymes with ‘tour’) is another of mum’s favourites. The Scottish name describes the sharp, lemony flavour well. There’s a tonne of it growing out the back of the cottage in the damp shady spot next to the old well. It’ll be a perfect partner for a fish caught from the loch. I’ve never really been that successful at foraging, but I enjoy it anyway. It keeps me in touch with the seasons and reminds me about the cycle of nature, and there’s something very reassuring about that. It’s good to know where the musky orange chanterelle mushrooms grow year on year and where the best sloes are to be found. I like late summer best for foraging – when everything feels rich, mellow and on the cusp of going over and off. 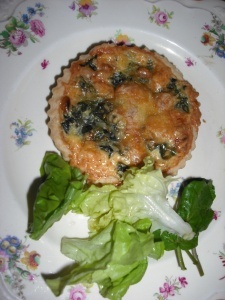 Lizs wild garlic quiche. And a few sprigs of not-so-wild lettuce. Spring is a fine foraging time too, and I spent the weekend just gone in the Wiltshire countryside making the most of all the new growth. With socks on our hands for protection, my friend Liz and I collected a bag full of young nettles, plucking the four tender leaves from the top of each plant. That’s enough for a big pot of soup that served about six (recipe below). Liz made a quiche with wild garlic, cheese and pine nuts and a wild garlic potato salad – a feast indeed. I spent a happy half hour early the next morning collecting more wild garlic before my friends were up. It promised to be a warm day, but the sun was still low in the sky and there was a chill in the air. The smell – garlic but not quite garlic with a hint of leek – hit me as I crossed the field to the stile into the wood. Wild garlic carpeted the ground, green and wet with morning dew. The crows cawed and circled over head, their big bundles of nests resting high in the bare trees were clear against the brightening sky above. I’ve great plans for wild food on the west coast. Armed with my trusty Food for Free book, I’ll be scouring the hedgerows, beaches and fields around the cottage. I doubt it will provide me with many square meals, but it will provide hours of happy rummaging and, hopefully, something for the pot. Here’s the recipe for the nettle soup. Sauté the onion for a few minutes then add the potato. Add the nettles and some chopped wild garlic if you have it. Add the stock, simmer until the potatoes are cooked and then liquidise the lot. At this point it tasted a bit bland, so we added more salt, some mixed spice (I think the traditional spice to add is nutmeg, but we didn’t have any) and a few spoonfuls of natural yoghurt, which worked a treat. It’s earthy, rich and green.